Fresh from the Farm Fundraiser! Students sell baskets of fresh Ontario fruit and vegetables to friends and family to raise funds to enrich our students’ school life. The produce is delivered fresh to our school from local Ontario farmers. The class that raises the most money will win an Apple Pie Party! *Notification of the exact delivery date will be sent to all families ~10 days prior to delivery. Please ensure contact information is included on order form. Welcome back to another great school year at John English! For families and students that have just joined us – Welcome to the school!! Over the course of the school year, fundraisers take place to help cover meaningful programs that might not be fully covered by the school budget. These programs include skating, Scientists in the School, the Ukelele program and additional support for classrooms. Based on the positive response to this initiative, we are continuing the option to forward a one time fundraising contribution per family in lieu of participation in other fundraisers. Although any amount that is suitable for your family is much appreciated, the suggested minimum contribution is $40 per family. The funds will be collected in the classroom and are due by Friday October 20th. One hundred percent of the proceeds from this contribution will come back to the school. 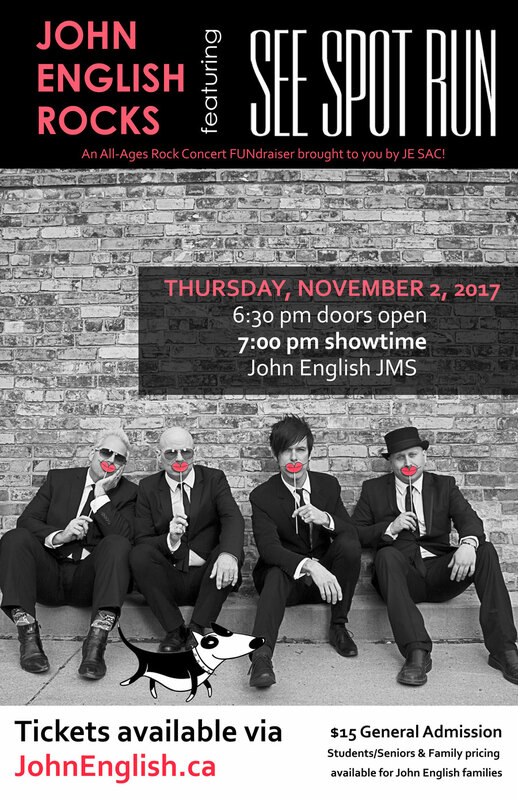 The John English School Advisory Council invites you to join us for an ALL AGES ROCK CONCERT in support of our school! Location: John English JMS Auditorium, 95 Mimico Ave. Available online via Eventbrite (discount code JEJMSFAMILY) – no additional fee for online orders! PDF Order Forms can be printed, filled out and submitted to your teacher with payment, in an envelope marked JOHN ENGLISH ROCKS. Free Childcare available for children aged 5 and under – please RSVP your childcare needs to sacinfo@johenglish.ca. Refreshments and raffle tickets will be available for sale. Fundraiser – SAMKO Toy Sale – On Now!! We are just a few days away from John English’s annual Movie Night and Basket Raffle! Please remember that basket items and pre-registration forms are due on Monday. You can also purchase basket raffle tickets in advance, $2 each or 6 tickets for $10 – simply include payment and the number of tickets you wish to purchase on the movie night form (use this form also even if you are not attending movie night) Thank you John English families for your support with this fundraiser, see you next Friday! We are still looking for volunteers to help assemble the baskets (on Wednesday) and also help on Movie Night. If you would like to volunteer please send an email to sacinfo. All of the information can also be found attached below. Dinner starts at 5:15! Come cheer on the Toronto Marlies with your fellow John English students, friends and family members on Sunday March 26 5:00pm at Ricoh Coliseum. We are offering tickets to the game and the tickets are $20 each. Tickets can be purchased by completing the attached order form [PDF] and submitting cash or cheque (payable to John English SAC). The order deadline has been EXTENDED and orders can now be submitted to the Main Office until Friday February 24, 2017. If you have any questions, please contact sacinfo@johnenglish.ca.. Note: Parents are responsible for transportation to and from the Ricoh Coliseum and also supervision of the students. If you are available to volunteer this week Thursday and or Friday please read the below message from our SAC. We are having our Fresh from the Farm order delivered to John English on Thursday morning. SAC is looking for volunteers to help hand out the orders for the apples and vegetables to parents, when they come to the school for their parent/teacher interviews.